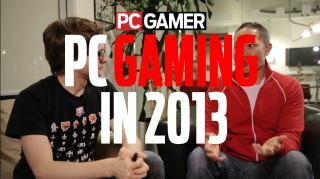 We've already assembled an exhaustive list of all the 2013 PC games worth keeping an eye on. But a lot of these merit more discussion—why are we mentally tap-dancing over BioShock Infinite and Metro: Last Light? What makes Clockwork Empires and Gone Home stand out among a stack of impressive indie games? In a special, hour-long discussion, Logan , Evan , and Tyler talk about what they're looking forward to most this year, and how the trends that emerged in 2012 will shape the months ahead.